Support this site - please! If you would like to support this independent and free site - and contribute a little via Pay Pal - you will receive not only our thanks but make a direct contribution towards the expansion of the site. Recording engineer tips on mic placement and getting the best sound - New area. These new features include: Steve Jordan, Pat Dillett, Berard Butler, James Towler, Ed Tutton etc etc. At the moment we have 27 video features in the queue for editing so once again, if you know any good editors that understand the industry, and are really, really cheap, please let us know! Chris Kimsey, Nick Brine, Mike Crossey, Mike Hedges, Dan Hawkins, Doug Trantow, Matt Marrin, Greg Penny, Ian Cross, Nick Davis, Flower Studios, Matt Salazar, LA Sound Gallery, Westlake Studios, Brad Gilderman, Dave Rideau, David Kershenbaum, Robert Carranza, Fran Ashcroft, Chris Sheldon, Dan Priest, James Loughrey, Mike Frazer and many many more! If you're a video editor and want to help out please get in touch! October 2008 - Several new features are now here including a video interview with young record producer Tristan Ivemy shot at Livingston Studios and a video tour around the fabulous Hook End Manor Studios. Coming soon is a full feature with Jay at Jutland Studios with a preview video now here. There's lot's of new 'stuff' coming so keep checking back and sign up for the newsletter (see above) to get the monthly updates. Laurie Latham, Chris Porter, Simon Humphrey and Ben Hammond plus two new videos following the drum sample recording sessions with legendary producer Ken Scott. New studio videos include Chair Works and AT Music Studios and feature in edit with Adrienne Aitkin at Runway Studios. We hope to have several more features added this month so keep checking back! August 2008 - We have been very busy! Coming soon... Some very interesting features! August 2008 - The first in the new Ken Scott drum recording series in now here. This is one of six features, a new one will be added each month! August 2008 - High Barn Studios video feature is now here! August 2008 - New studio features shot at several studios are in edit, these include High Barn Studios in Essex (UK), Chair Works and many others. July 2008 - Clint Murphy short drum recording technique video shot with Greg Haver at Modern World Studios. Clint was over from New Zealand and took a few minutes out to chat on camera. We have been very busy filming lots of new producer features so keep an eye out in the next few weeks for some great new music producer interviews! June 2008 - The start of our recording tips and techniques section starts with Craig Silvey talking about his drum recording techniques and Cameron Craig talking about his unusual drum recording techniques. The new tips and techniques area will be a while before linked from the main menus while we gather and edit enough features to make it big enough! We have hundreds of videos to add so keep watching out. June 2008 - Record producer Phil English talks about his new studio, Alexander Sound, in Milton Keynes, UK. June 2008 - Fab new UK residential studio, Leeders Farm Studio, feature now here. June 2008 - Special video feature with record producer Laurie Latham is in production, due here in July. Laurie Latham pictures. 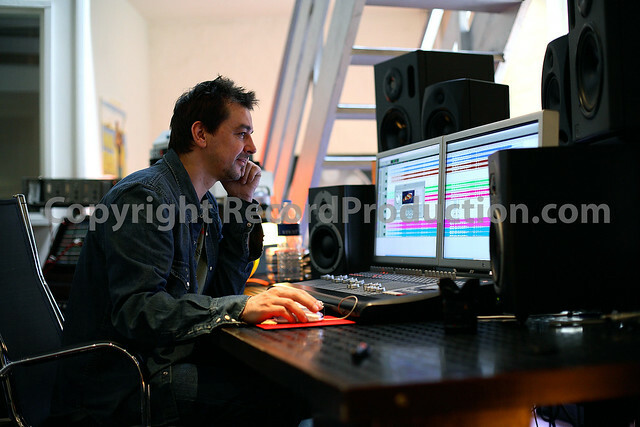 June 2008 - Record producer Paul Epworth picture gallery is coming soon. June 2008 - New feature in production is legendary American record producer Bob Marlette. View his pictures in the image gallery. June 2008 - Updated Air Studios pictures and new feature in progress. Picture gallery. June 2008 - Monnow Valley Studios, residential recording studio in Wales new feature. June 2008 - Milton Keynes (UK) Alexander Sound Studios feature in production including an interview with in house engineer and producer Phil English. Picture gallery. June 2008 - Our studio shop links have been expanded. June 2008 - Laurie Latham, record producer feature in production. June 2008 - Lots of new and updated recording equipment reviews pages. This area is expanding so we welcome your gear review to add! June 2008 - Irish recording studio - the Nut Shed - feature in production. Picture gallery. Our first Irish studio feature! May 2008 - Producer and engineer feature with Bruce Miller at Redemption Studios, NJ, is now here. May 2008 - New features built in to the Featured Record Producers pages, run your mouse over a thumbnail for a larger picture. May 2008 - Trevor Horn, legendary record producer and musician video feature is now here! One hour of Trevor Horn in an exclusive two part HD video interview shot at SARM Studios, London! The pictures that we took of Trevor appear on the cover of May/June 2008 issue of Resolution magazine! May 2008 - Coming soon is a video feature with record producer / recording engineer Cameron Craig, the video feature will be here by end of June. May 2008 - Record Producer feature with Bob Both at Twain Recording is now here. May 2008 - Studio features coming soon include fab Irish Studio, the Nut Shed (picture gallery is here), Pinna Productions, Kore Studios and West Point Studios. April 2008 - Even larger video sizes are coming. The first is Andy Gill's video. More mega large videos are coming soon! March 2008 - Two more producer features in production. Craig Silvey talks with George Shilling at Konk Studios about working with the Coral and much more including some really cool drum mic techniques. Jerry Boys talks about production and recording artists live in the studio while at Livingston Studios, London. These features are scheduled for viewing April 2008 together with new videos from Johnny Jaskot in the States and more studio tours. March 2008 - New video feature with legendary record producer Chris Tsangarides is now here. It runs for over 30 minutes and includes tips on how to set your mixing console on fire safely - Apparently "Cadac's burn best"! This is one of our favourite videos! March 2008 - New video with leading metal producer Dave Chang is now here. March 2008 - Lots of new videos coming this month including an exclusive video interview with Andy Gill. March 2008 - Classical music producer Jon Cohen talks with George Shilling on camera about recording bag pipes and much more! March 2008 - New video feature with Grammy winning Simon Gogerly at his Hub2 studio. March 2008 - Over the last few years we have increased the quality of pictures and videos by spending every penny earned from donations, picture sales to advertising. This hasn't been enough so we have funded the site out of our own pockets to raise the quality and hope that you are pleased with the results. Any donations towards the site's running costs are very welcome but all features are and will be free. Feb 2008 - This month we have been busy being ill with flu and editing - a whole bunch of new videos are coming soon. Pictured: George Massenburg at a recent event at KMR Audio, London. Jan 2008 - Steve Lipson video feature is now here! Legendary record producer Steve Lipson talks with George Shilling about his career and his new studio set within SARM Studios in an HD video. January 2008 - Producer Steve Williams features in a new HD video at his London recording studio, Chapel Studios. January 2008 - Jon Cohen video interview in edit. January 2008 - New FORUMS are now here. It's a bit quiet in there due to loosing all the previous posts (thanks hacker mate) so please pop in and even just say hi. January 2008 - Cream Studios feature in production. This is a brand new studio in London for orchestral recording! December 2007 - Sorry but the Forums have had to be taken down due to a hacker. New forums will be here as soon as possible. December 2007 - Lots of new videos coming this month including Andy Gill. December 2007 - New pictures from Grammy winning Simon Gogerly Hub studio. November 2007 - New Greg Haver video feature shot at Modern World Studios is now here. Also, a new 2 minute short video tour of Modern World is now here featuring engineer Ben Muscat. November 2007 - New look Producers area. Let us know what you think. ALL CONTENT - IMAGES & VIDEO IS COPYRIGHT. PLEASE DO NOT COPY, DEEP LINK ETC WITHOUT PERMISSION. Information about the production team and getting involved is HERE. Remember, being featured costs nothing except your time! For reasons beyond our control we are no longer able to accept articles for publishing from third parties. For the latest industry news, please visit one of these websites! (Please note that by following these links you do not hold this site responsible for any content so contained - ie, if you don't like a story, don't try to sue us). Warren Riker is one of the fastest rising record producers in the industry today. This is just one of 122 record producers video interviews here. Visit George Shilling's equipment reviews of gear that he's tested in real life recording sessions. Recording equipment reviews.